Looking for worksheet practice that doesn't feel like a worksheet? This activity allows students to practice adding fractions with like denominators. This particular maze will require students to correctly complete 9 different problems to make it through the maze, although all 20 problems included in the maze have a correct answer listed. 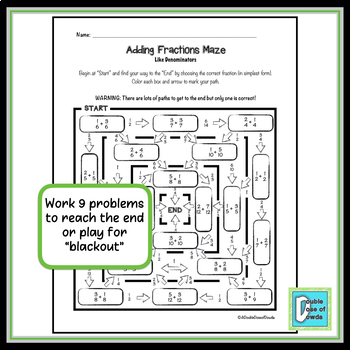 This is the first and easiest level of our Adding Fractions Maze Bundle. 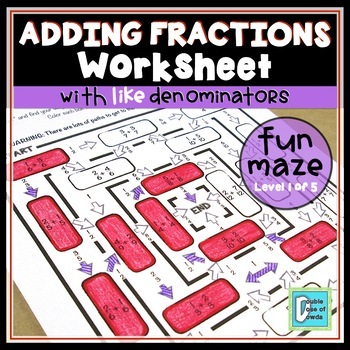 ♥ "This was a really fun way to review the addition of fractions with my 4th graders. They loved it! Thank you for the great resource!" ♥ "Anytime you can turn math into a game, I'm on board! My students loved this and I really liked how it was almost self-correcting- so helpful when trying to help a whole classroom of kiddos. Thank you!" ♥ "Fabulous product that my kids thoroughly enjoyed playing (well, really working!)."